Hardwoood specialist Danzer informed numerous visitors about their innovative hardwood applications. At the “Bayerischen Landesgartenschau” (Bavarian State Garden Show) in Wuerzburg, which lasts until October 7th 2018, the international hardwood specialist Danzer supports the Bavarian State Forestry with selected objects at the focus week "Innovative Hardwood Applications". Since the hardwood share in the Bavarian forests is increasing constantly, the forestry administration wants to promote the use of the renewable hardwood resource. 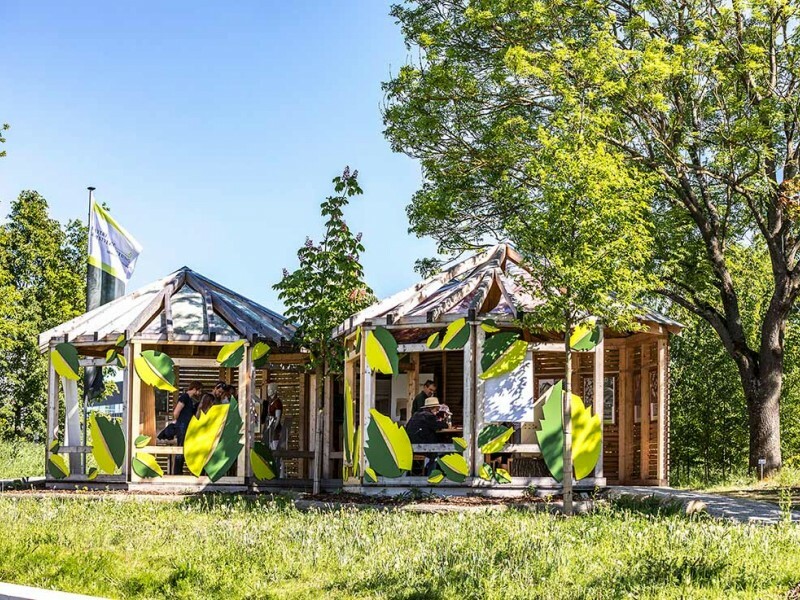 Numerous visitors gathered information about the innovations exhibited in the Bavarian State Forests’ pavilion. Danzer contributed the famous Eames Molded Wood Side Chair, which is available in North America, and provided insights into the development of a hardwood lightweight board. More and more hardwood trees are growing in Bavaria, the Bavarian State Forestry reports. The share of hardwood in forests rises as the Federal Forest Inventory 2012 showed. In the 1980s the hardwood proportion was 26 %, 25 years later there were 36 % hardwood trees in the Bavarian forest - and the number is still rising. Michaela Kaniber, Bavarian Forestry Secretary, believes in the great potential of wood. “The future lies in wood,” Kaniber said at a symposium in April this year. 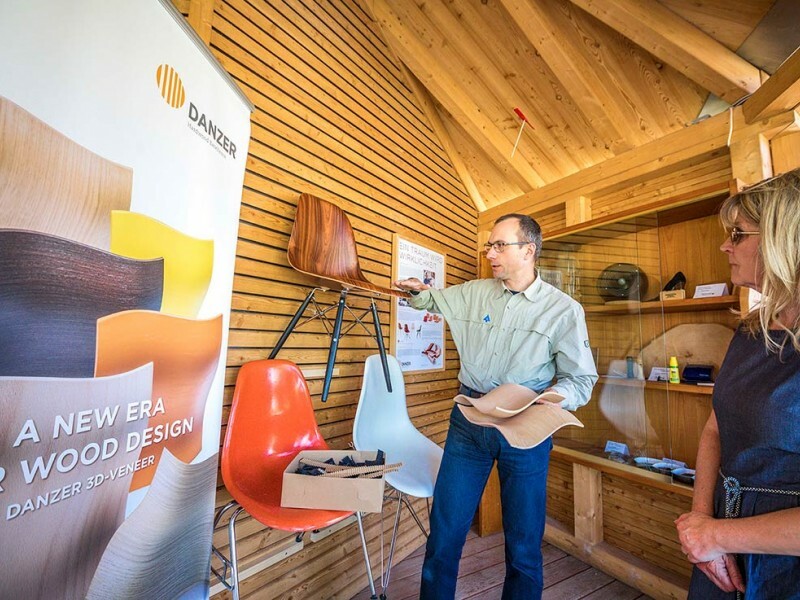 The Eames Molded Wood Side Chair, which was exhibited at the Garden Show in Wuerzburg, was made from Danzer 3D-Veneer. This material allows the design and industrial production of organic wood shapes. “Since its market introduction, we have completed hundreds of 3D-Veneer projects - we support our customers from the initial planning stage all the way through to completion with our know-how. The Eames Side Chair presented at the Landesgartenschau is particularly eye-catching. The legendary chair was available only in fiberglass and plastic prior to the invention of 3D-Veneer and has been available in North America for more than 5 years now,” says Eckart Schmitt. Visitors were also informed about the Danzer Freeform technology in the pavilion - an industrial process that adds metal inlays to wood surfaces. Danzer also provided insights into the development of a lightweight board made of hardwood. “When we accomplish the development of the board, it will have numerous advantages compared to products already available on the market - it fits in perfectly with the show’s organizer's objectives,” concluded Eckart Schmitt.